A couple of weeks ago I went back to my family home for the weekend and it made me so nostalgic for my childhood and memories associated with growing up. It's a strange thing childhood and teenage years, or it is for me, because I always felt like I'd want to be at home more than anything for my whole entire life - I'd never lived anywhere else so it was natural I suppose, but moving away has made me see things differently but with a whole load of nostalgia. I'm really lucky to be able to say that I had a pretty good childhood. I got on well with my brothers so I was never really that bored, and my extended family all lived really close by so it was so nice to create little family traditions over the years. I definitely didn't appreciate those when I was growing up, but I really do now, and it's those kinds of things that I get nostalgic about going back to my family home. It's the same house I grew up in and my bedroom hasn't changed that much over the years because it's wallpaper so it's not a simple case of a lick of paint, so I guess nostalgia is inevitable. Growing up, I loved books, and some of my favourites were the Miffy books that my grandparents had. Even when I got older, I'd still love reading them to my younger cousins simply because it was an excuse to read them again! They're such nice stories, and the images of thick lines and bright primary colours clearly appealed to little child Emily. I remember going on a trip to London to stay with some family, and the highlight of the trip was seeing a Miffy exhibition. I can't remember if it was some kind of anniversary or something, but it was really interesting as I pretty much idolised Miffy - I wish it was still on. 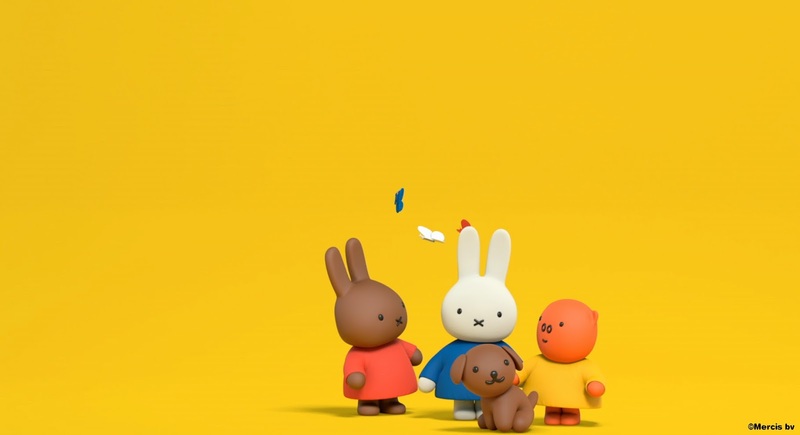 I think the really simple idea behind Miffy is something that's so appealing to children, and the love of the simplistic design is something that's stayed with me. What I love about Miffy now, is all the memories that I'm able to share in with my cousins and grandparents. One of my cousins spent a year studying in The Netherlands last year and whist she was there she visited the Miffy museum, which of course my grandparents loved hearing about as they'd introduced us to the character of Miffy when we were little. This year is the 60th anniversary of Miffy, and to celebrate Miffy is having a bit of a revamp to engage a whole new generation of Miffy fans. One of the ways this is being done is through a new kids TV show on Tiny Pop which I'd be lying if I said I hadn't watched an episode or three. It's such a nice idea and a new way of getting more children into Miffy - it's clear I love Miffy from my childhood and if I ever have a family of my own it's a character I'd want all over the house because who doesn't love the little white rabbit? !